Join us for Slichot, Yom Kippur, and Succot! Staring Sunday September 24, 2017 and throughout the week of the Ten days of Repentence, the regular Jewish section of the Cave of the Matriarchs & Patriarchs / Tomb of Machpela will be open 24 hours a day for slichot services. Ashenazic slichot services will be held every night at 12:30AM. Morning minyan at dawn will be held at 4:50AM for Ashenazic services and 5:00AM for Sephardic / Mizrachi services. On Tuesday the 6th of Tishrei (September 26, 2017) the entirety of the Tomb of Machpela including the Hall of Isaac and Rebecca (normally used as the Muslim section) will be open to the public, an occurrence that happens only ten times a year as part of our rotation agreement with the Islamic Waqf. The Isaac & Rebecca Hall is the largest in the complex and included the actual opening into the underground caves. It will be open starting at 4:00 AM until late into the night concluding with the end of slichot services. 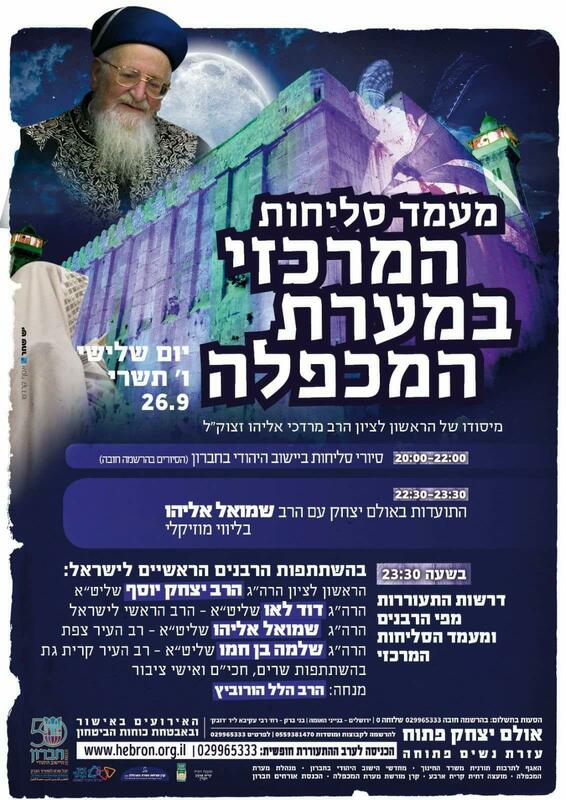 Tuesday night's midnight slichot services will be led by the two Chief Rabbis of the State of Israel, Ashkenazic Chief Rabbi David Lau and Sephardic Chief Rabbi Yitzhak Yosef. Other guests will include the Chief Rabbi of Tzfat, Rabbi Shmuel Eliyahu, noted public leaders and Members of Knesset. On Wednesday the 7th of Tishrei (September 27, 2017) the annual Women's Prayer Gathering and concert will take place outside at the foot of the Tomb of Machpela with thousands expected. Admission is free but registration of mandatory. Performers will include Etti Ankri and Ruhama Ben Yosef with a special inspirational address by Rabbanit Yemima Mizrachi. On Saturday September 30, 2017, the day of both Shabbat and Yom Kippur, the Tomb of Machpela including the Hall of Isaac and Rebecca will be open for Jewish services all day. On the intermediate days of Succot Monday October 9th and Tuesday October 10th the Tomb of Machpela will be open in its entirety including the Hall of Isaac and Rebecca. The annual Sukkot music festival will be Monday October 9th with thousands expected and concerts and event throughout the day. The pre-Rosh Hashanna concert took place on September 18th and was a successful event attracting thousands to the city. Veteran Jewish American singer Avraham Fried shared the stage with Israeli pop sensation Kobi Aflalo.